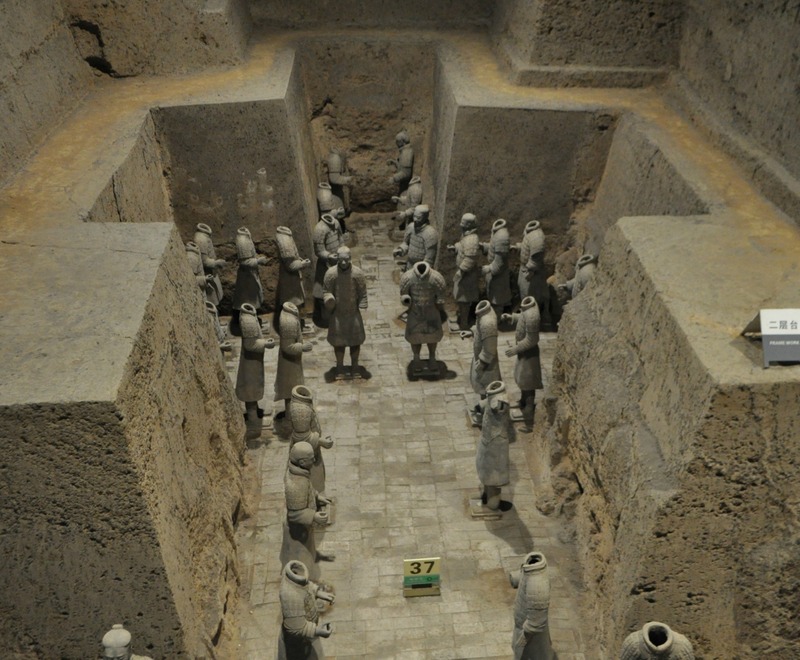 Day 476 In Beijing: Trip To Xian, Terracotta Warriors, Part 6. Jill and I primarily take photographs but we also realize that having a video of something as magnificent as the Terracotta Army makes a real impression on others. It is still hard to comprehend the size, and amount of soldiers, if you aren’t there in person, but this gives a better representation of it all. If you are ever in town, to paraphrase Ferris Bueller, I highly recommend visiting it. Day 475 In Beijing: Trip To Xian, Terracotta Warriors, Part 5. 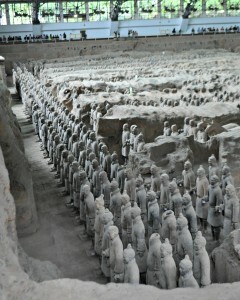 The final shot of the Terracotta Army. Jill and I continued our tour around Pit 1 and were able to see more of the warriors that were getting excavated and refurbished. We didn’t hire a guide, since we were in a rush and didn’t want to bargain. Yes, everything in China is a bargaining event and it gets very tiring. Sometimes we just want to pay a fair price and be done with it so we just give up and don’t bother. Imagine living each day as if you were going into a car dealership and having to bargain for a lot of what you want. It tends to make us cynical and jaded and we, therefore, don’t have as much interaction as we normally would with others. So, we skipped the tour guide and I wish we hadn’t because I would have liked to know why they are wrapped in cellophane. Our guess was they were being glued back together and this allows them to hold until the glue settles but we aren’t sure. Either way, walking around the back of the exhibit was a wonderful way to end our visit to the Terracotta Army. 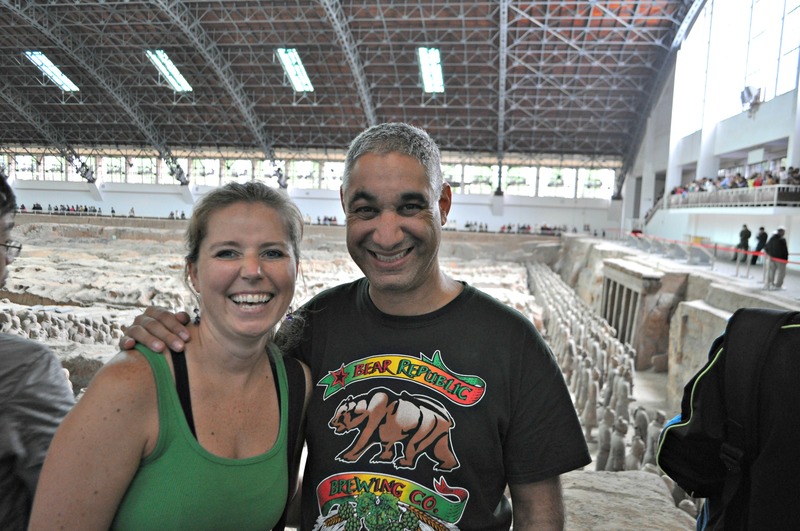 Day 474 In Beijing: Trip To Xian, Terracotta Warriors, Part 4. Jill and me in front of the army. Jill and I kept cruising around Pit 1 and looking for places to take pictures of this magnificent vision. We loved every second of it, other than the pushing and shoving, and we really amazed by all the different people visiting the site. We didn’t realize it, but there were about 15 other EACHAM people there at the same time we were there. Well, we saw a bunch of expatriates walking around and one of them was very noticeable. His name, we found out later in the day, was Phil, and he was from Austria. Why did Phil stand out? Phil stood out because Phil stands about 6 feet and 7 inches tall. He is a giant in China. He is also a very kind person and when we ran into him the next day at the expo that EACHAM paid for us to go to, he invited us to tour the Xian City Wall and check out the Muslim Quarter inside the wall afterward. We ended up meeting a bunch of new friends, from many different countries, which I will blog about in a few days, and having a wonderful time. It is repetitive but this is why Jill and I love being expats: We meet so many people, with so many different stories, from so many different parts of the world. I think that is also why I loved dancing Cuban style salsa back in the USA: It brings together such a diverse community, from all over the world, the just enjoy being together and connecting. I’ve included a few of the pictures that the nice Australian couple took of us while we spoke with them. Day 473 In Beijing: Trip To Xian: Terracotta Warriors, Part 3. It was time to for Jill and me to see Pit 1. We went in a side door as we were continuing our backwards trip and therefore we entered into the end which was not nearly as busy as the main doors. It was actually a wonderful way to start/end this visit as the crowds near Pit 1’s main entrance were incredibly deep and people were pushing and shoving a lot. Now, pushing and shoving is very common in China but Jill and I just get sick and tired of feeling like you have to fight someone just to stand where you are. It is honestly something we will not miss when we leave and one of the most aggravating issues with crowds in China: people just have no sense of space or respect for other people who are near them. It is a cultural issue that I will never get used to, and honestly, don’t intend to because if I did that in the USA, or pretty much anywhere else, I’d get beaten up. Therefore, going in the back way, where it was almost empty, was incredibly relaxing and a relief. We also wandered against the flow of people which allowed us to stop and see what we wanted and not be pushed along by the masses. Pit 1 was absolutely amazing. It is massively long and incredibly wide. They have done a wonderful job rebuilding the warriors and making them as realistic as possible, again without the painted armor and wagons, and it is very powerful to see them lined up and ready for action. Jill and I walked all the way around the pit and asked an Australian gentleman to take our picture so we could show that we were there and have some wonderful memories. We talked to both he and his wife, and they were on a one month tour, and they were retired. He lived about 1 hour north of Melbourne and had run an organic farm that was very successful and now just relaxes, enjoys life, and they travel for about 1-2 months a year. This year they chose to visit China. They said that they had enjoyed their trip but are ready to get home to some peace and quiet and fresh air. As I lived in Melbourne, back in 1990, for one month, I absolutely understood and envied them. Living on the beach, in fresh air, and with quiet, is something Jill and I are very much looking forward to sometime in the future. They told us that they generally aren’t tour group people but decided to do one because they’d heard traveling in China is tough. They had booked a tour through an agency in the USA and ended up with 35 North American tourists, 1 Canadian and themselves. They said it had been fun to meet all these North Americans, and the one Canadian, and it was a very different experience than it would have been with just Australians. Just another reason I love to travel, meeting so many people, having so many different experiences and view points, and allowing themselves to be exposed to life in a different way. This is exactly the life Jill and I want to have, and are having, at this moment. We are incredibly grateful for the ability to live this life, have these experiences, and go places that many people will never go. Such is the life of an expatriate. Day 472 In Beijing: Trip To Xian: Terracotta Warriors, Part 2. A view of the larger area in Pit 2. Jill and I continued on our way to Pit 2 and found it to be tiny compared to Pit 3 but much more personal and powerful. 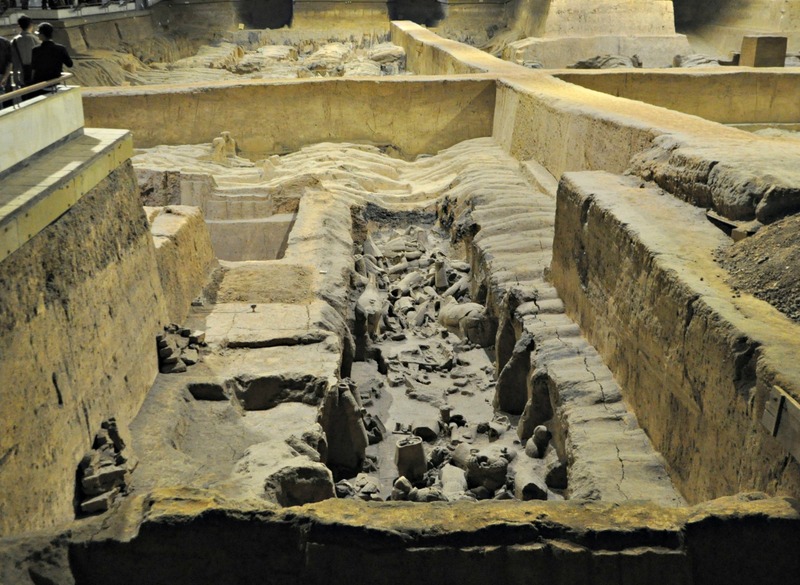 There were many more Terracotta Warriors, and their horses, in this pit and it is was much more excavated than Pit 3, which they believe was the command center. Pit 3, from what we’ve seen, is one of the newer pits to be excavated and is still quite unexplored at this time. Pit 2 was much more developed, clean, and we had a very clear view of the statues. It is full of the cavalry and infantry units. There were supposedly war chariots here also. It seems to have represented the military guard. The horses, by the way, all used to have wagons made out of wood. It seems that they people either burned them or they rotted with time according to the signs and information around the pit. We were not able to see any descriptions of what the wagons looked like but I’m guessing they were very ornate and incredibly beautiful. Speaking of beauty, the terra cotta warriors were originally even more beautiful as they were painted in bright blue, orange and other colors that have faded with time. There were a few pictures of what they probably looked like and it would have been an incredibly impressive army to see set into the ground. Not to say that this army wasn’t impressive enough but it would have looked like an army of warriors in rainbow colored armor. By the way, the warriors were found by some farmers that were trying to dig a well and had been lost to history until that time. Can you imagine just trying to dig a well and happening across the beginning of this massive army underneath your land? 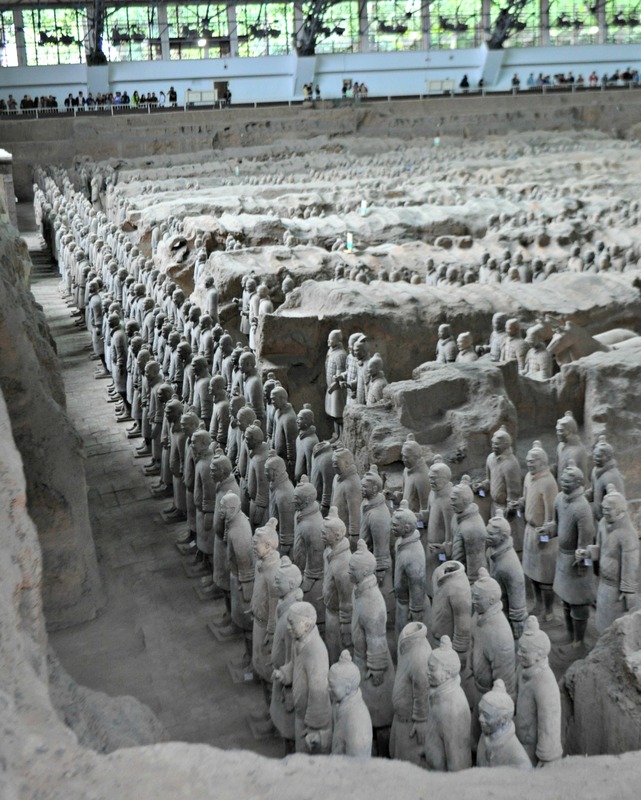 By the way, Qin Shi Huang was the emperor that had these all built for him before he died at the age of 50. He united all of China while being the first emperor of China. Oh, in case you feel a little inferior at this point since this guy did all that, just add to his resume that he was the one that started the Great Wall of China. And survived over 3 different assassination attempts. 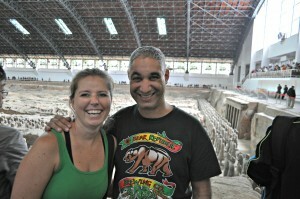 Day 471 In Beijing: Trip To Xian: Terracotta Warriors, Part 1. Many more soldiers being excavated. Jill and I interrupt this trip to Turkey and Greece for a short sojourn into China. In case you didn’t realize, I tend to write my blogs after the event has happened. Obviously this is a necessity because if I wrote them before they happened it would just be fiction and this is a, in as much as possible, a non-fiction blog of Jill’s and my journey through China and other countries that we will visit as we live in Beijing. With that in mind, I want to jump into our trip to Turkey and put up some posts about our trip to Xi’an. This actually happened just a few days ago, unlike our journey to Turkey and Greece which ended over a month ago at this point. I could wait to write about Xi’an, and keep things strictly in chronological order, but this was a very short, yet powerful, trip. Jill and I heard about EACHAM (European/American Chamber of Commerce) through our friend, Mike Shaw. EACHAM sets up expatriates for 2 or 3 day trips, to major industrial conferences and expositions, and pays for our transportation, hotels, and meals. Basically the expos want to have foreigners there and this is where we come in. It is a heck of a deal, for us, because we get to see a different part of China and don’t really have to pay much for it other than some added extras of going to see things that aren’t on the tour. 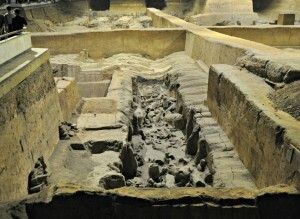 This is where the Terracotta Warriors made our decision regarding going to Xi’an a very easy one. We’d both seen lots of pictures of the Warriors and had set seeing them as a “must do” before we leave China. When we were offered an all-expenses paid trip to Xi’an, about 1 hour from the Warriors, we jumped at the chance. EACHAM paid for an overnight train to Xi’an, which took about 11 hours, and there were 4 bunk beds in our cabin. We shared the cabin with a mother and her adult daughter and had a very nice time other than the beds being pretty hard. We also met some of the other expatriates going up to Xi’an for the same conference and talked about life in China. 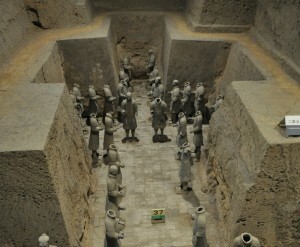 After we arrived in Xi’an, we set out to hire a cab and get out to the Terracotta Warriors. It took about 1.5 hours to get there, as traffic was bad and there was a lot of construction, and $60 USD, but it was well worth it. After exiting our taxi, and making sure the driver knew we wouldn’t pay until we returned to Xi’an (something we’d been told to do by others that have done the trip because the taxi drivers tend to leave if they get a better offer) we walked to the entrance of the attraction. We saw that we could get a ride on a little electric tram and hopped right in to save time. There were 3 different buildings to choose from and we decided to see the last one first (Pit 3) as the other two seemed incredibly packed and we were hoping they would empty a little bit before we visited them.